Maia Morag is returning to Israel after serving the last four years as Cincinnati’s Community Emissary (shlicha). She is pictured with her family, husband Amit, and children Rey, Gili, and Ella, who was born in Cincinnati. Since August 2014, Maia Morag has been Cincinnati’s Community Emissary (shlicha) from Israel. 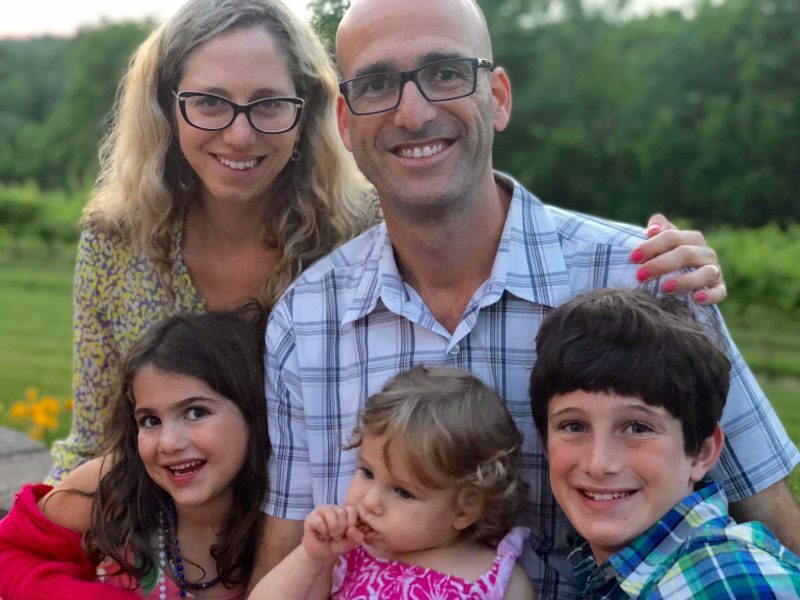 As she leaves this month to return to Israel with her family (which has gained a member since they arrived) Maia shares her thoughts about her experience here, and we hear and from Federation leaders about the indelible impact she has made on our community. Maia Morag hosted a community forum in August 2017 with Israel’s Consul General, Ambassador Dani Dayan, about freedom of religious expression in Israel. Here’s something you never knew about me: I named the folder holding the endless application materials and screening documents for the shlichut, “Italy.” I thought that Europe was not so far from my family and that I would drink coffee in the piazza. I would learn Italian, I thought. Before I came, Cincinnati leaders told me that “Israel is the only thing the community agrees on.” It sounded odd to me. How can they agree on Israel? Because in Israel, we do not agree on anything. But I was naive and believed it. Being an emissary is to be in a fascinating position, one not many get to enjoy in their lifetime. I was living in two worlds at the same time. I was asked to move here and be an Israeli, but I also had to integrate into the American culture. I was living on the border, only to find out that the border is not a fine line. There is space between worlds, where you can play and experiment—a place where there is no right or wrong, where there is no one way, and where there is an evolving set of tools. The first voicemail that awaited me when I got to the Federation office was a message to coordinate a lecture in May. I thought surely it was the wrong date. May was ten months away! I learned quickly that here there is much, much planning ahead. I learned that in the United States, Israelis are not considered serious or trustworthy and change everything at the last minute. I taught people, however, that it’s our reality that changes all the time. We don’t know what will happen in six months. Here in the United States, there is stability; the future looks quite similar and promising. So while in the US, I started to plan. I did so much planning for Israel at 70, in fact, I feel Israel is already 90 years old! Maia Morag, Cincinnati’s Community Emissary (shlicha), leads a table of lay and professional leaders in discussions about how Cincinnati can better connect with Israel at a 2015 Israel Summit. When I was interviewed in Israel, I was asked what I would do in Cincinnati as a shlicha. I was asked what I would bring to Cincinnati from Israel. I said I would bring Achinoam Nini and Mira Awad. I did not realize then that I was saying something radical. My goal was to present a complex reality of Israel. However, I found within the community the desire to keep Israel uncomplicated, a bit mythical, and sublime—to support Israel without criticism. Criticism and exploring challenges were seen as a betrayal of this support. It was clear things needed to change. We have no choice but to look reality in the eyes. Loving Israel does not mean a lack of criticism. Recognition of Israel’s challenges leads to engagement, not indifference. Israel is not only complex, it is a real place. And reality is not one-dimensional. During my four years here, I adopted two slogans, “Israel beyond Camels” and “You Know It’s 2018 in Israel, Too!” We don’t ride camels. We are not always right. We do not agree on a lot of things. Our government is far from perfect. We have a deep and difficult conflict with the Palestinians that requires a solution. And we must talk about it. Why? Because the younger generations are exposed to many sources of information, and they are no longer buying it. And they are right. Shortly after I arrived, I noticed that in the United States, we teach our children about a land flowing with milk and honey, because we believe it is too complicated to share the complexity with them. They leave elementary school with a picture of a perfect Israel that’s never wrong, but they go out into the real world and learn about BDS, and they hear that Israel is an apartheid state, and they do not have the tools to deal with these statements. We didn’t give them the tools because we said it was too complicated. Life is complex. Children understand complexity. It is our responsibility to give them the tools to deal with it. We do not have to fear that because of the complexity, they will not love Israel or will not feel connected to Israel. Israel is part of our story. To turn Israel into a real and relevant reality, we need to create ties with Israel. We do that through the Partnership2Gether platform, which creates people-to-people connections between people living in Cincinnati and Netanya. Indeed, our partnership with Netanya and the many projects that we build in partnership every year are a role model throughout the continent. I feel fortunate that I was able to lead P2G with Sharon Spiegel. I have learned so much about cultural relativism, about the difficulty in forming connections between different people and cultures, and about the infinite potential that is inherent in these connections—experiences that are truly life-changing. Promoting Jewish pluralism in Israel is my field. It was my background before I came to Cincinnati. So it’s something I’m passionate about. I spoke about the importance of the subject on many occasions. I lectured in the various synagogues, and I brought lecturers to talk about the issue. I advised the Israel & Overseas committee when it expanded its allocations process to include pluralism organizations in Israel. I was privileged to be a member of the community supporting iRep and the Freedom of Marriage Choice initiative, led by Kim Heiman, which is bringing significant change in the perception and life of many Israelis and in their relationship to Judaism. I wrote the letter from the emissaries living in the United States to the Israeli society, following frustration after the freezing of the Western Wall agreement. The contribution of our community to promoting Jewish pluralism in Israel is important not only for relations between Israel and the Diaspora, but also for the life of all Jews living in Israel, their connection to Judaism, and their future in the State of Israel. I learned that there are lots of “Americas.” America is not only New York and Los Angeles. I learned the best part of America is the Midwest. I learned to plan in advance—way in advance. I learned how to write archaic, polite emails—in English! I learned how important it is to invest in creating relationships. 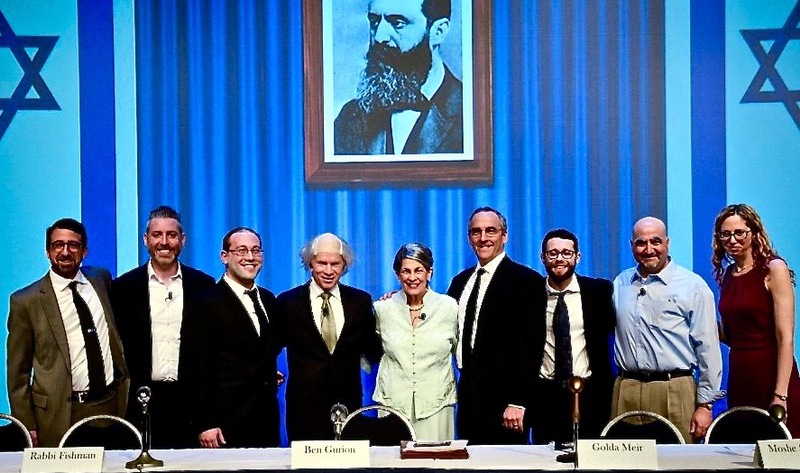 The connections I had made with the rabbis in the city, the programing staff at the Mayerson JCC, the religious school, and Hebrew Union College-Jewish Institute of Religion all enabled the trust that enabled the action. I realized that community work requires endless investment in relationships. And I have learned how well this is done in this community. I learned how much collaboration is key to success and how much the Cincinnati community invests time and energy to ensure that these relationships take place. I learned how important it is to invest, strengthen, and build ties between Israel and the Diaspora—and how the future of the Jewish people depends on it. Maia Morag (far right) is pictured with participants of a February 2018 reenactment of the Israeli Declaration of Independence, part of a day of learning in celebration of Israel at 70. On the family level, we have had the opportunity for our older kids, Rey and Gili, to receive a great Jewish and general education at Rockwern Academy and the JCC. They speak fluent English—and American (as Gili says). We got to bring into the world Ella, our American girl who whenever people ask her where she was born, she will say Cincinnati, Ohio. Amit got to teach Hebrew to many people in the city and at Miami University, and he got to work with Steve Albert, a member of the community who helped us a lot during our fourth year in Cincinnati and who adopted Amit as an employee and partner. As a family, we have had the privilege of being hosted by many of you and having hosted many of you in our house. We traveled a lot and saw breathtaking views, and we met many different “Americas.” We enjoyed the long weekends and the convenience of living in America. Cincinnati—where every place is a 15-minute drive away. It was quite a ride. It’s hard for two seashells to share a real conversation.